The introit is "Come, Dearest Lord, Descend and Dwell." (It is the introit on the sheet with two other responses on it, "Father, Fill Us with Thy Love" and "Father of Mercies.") The words are by Isaac Watts. The tune is FEDERAL STREET by Henry Kemble Oliver (b. Beverly, Massachusetts, 1800; d. Salem, Massachusetts, 1885). As a child, Henry Oliver attended church on Federal Street in Boston, and Federal Street was also the name of the street in Salem where Henry Oliver's future wife lived, and where, he said, he "wooed, won, and married" her. The opening hymn is "O Love, How Deep, How Broad, How High," no. 83. This is the hymn sung to John Dunstable's "Agincourt Song," DEO GRACIAS, sometimes called DEO GRATIAS, ANGLIA. This was also the opening hymn for the service of the second Sunday in Lent in 2014. The original words of "O amor quam ecstaticus" are attributed to Thomas à Kempis, who was born in Kempen, near Düsseldorf, about 1379. 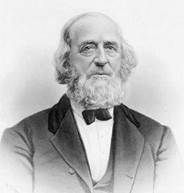 John Julian, writing in the Dictionary of Hymnology in 1907, says of Thomas of Kempen: "Thomas's hymn writing is not regarded as being of the highest standard," but Mr. Julian is generally a bit snooty in his appraisals, and, as a hymn critic, few hymns met his standards. The original anonymous text in Latin ("O amor quam ecstaticus") comes from a fifteenth-century manuscript from Karlsruhe. The twenty-three-stanza text has been attributed to Thomas à Kempis because of its similarities to writings of the Moderna Devotio Movement associated with à Kempis (that movement was an important precursor of the Reformation in the Netherlands). However, there is insufficient proof that he actually wrote this text. The translation is by Benjamin Webb who was born in London in 1820. Webb attended Trinity College, Cambridge, graduating with a B. A. in 1842. He was ordained by the Bishop of Gloucester and Bristol in 1843, then went on to obtain a M. A. at Cambridge in 1845. Luckily for us, the translator doesn't appear to have translated all 23 stanzas of the original. Some hymnals have six verses, but the 1990 Presbyterian Hymnal omits the third verse, "For us he prayed; for us he taught, for us his daily works he wrought," leaving only five verses. The Old Testament reading, Genesis 12:1-4, is the story of Abram and Sarai, and his nephew Lot and his wife, leaving their home in Haran to go to the land of Canaan, as God has directed Abram to do, despite his being 75 years old. Before living in Haran, Abram, Sarai, and Lot had lived in Ur. Ur used to be identified with the Sumerian city of Ur in lower Mesopotamia, but some scholars think Ur was more plausibly located in upper Mesopotamia in present-day Syria. Scholars appear to agree that Haran was located in present-day Turkey. 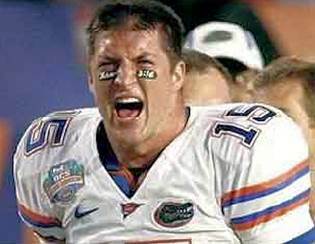 Tim Tebow with John 3:16 painted on his face. Jesus replied, "I tell you the solemn truth, unless a person is born from above, he cannot see the kingdom of God." Nicodemus said to him, "How can a man be born when he is old? He cannot enter his mother's womb and be born a second time, can he?" The word ἄνωθεν (anwqen) has a double meaning, either "again" (in which case it is synonymous with παλίν [palin]) or "from above." This is a favorite technique of the author of the Fourth Gospel, and it is lost in almost all translations at this point. John uses the word 5 times, in 3:3, 7; 3:31; 19:11 and 23. In the latter 3 cases the context makes clear that it means "from above." Here (3:3, 7) it could mean either, but the primary meaning intended by Jesus is "from above." Nicodemus apparently understood it the other way [that Jesus was speaking of a second physical birth], which explains his reply, "How can a man be born when he is old? He can't enter his mother's womb a second time and be born, can he?" 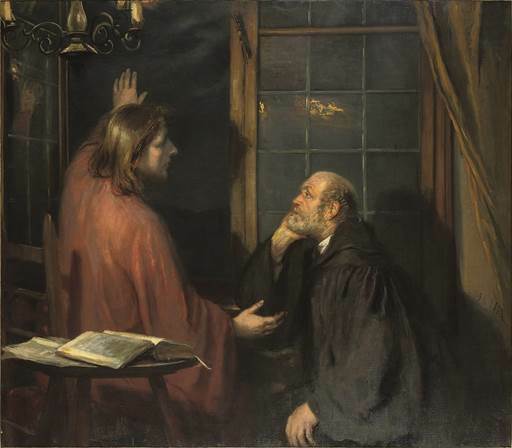 The author uses the technique of the "misunderstood question" often to bring out a particularly important point: Jesus says something which is misunderstood by the disciples or (as here) someone else, which then gives Jesus the opportunity to explain more fully and in more detail what he really meant. That raises the question of whether this was a device used by the author of the gospel to make a point rather than as a recollection of the actual words of Jesus. Jesus, after all, would probably have been conversing with Nicodemus in Aramaic, not Greek. This doesn't have to be a problem, as Aramaic also has a word, men derish, which can mean either "again," that is, a second time, or "from above," (men derish literally means "from the head"). Indeed, Aramaic versions of the New Testament have existed since ancient times (the Syriac Peshitta version), and men derish is precisely the word that is used in these verses in place of the Greek word anwqen. There is another puzzling reference in the reading about Moses lifting up serpents (John 3:14-15). It is a reference to one of the many times the Israelites tired of their journey through the wilderness and complained to Moses, Numbers 21:4-9. Then they traveled from Mount Hor by the road to the Red Sea, to go around the land of Edom, but the people became impatient along the way. And the people spoke against God and against Moses, "Why have you brought us up out of Egypt to die in the wilderness, for there is no bread or water, and we detest this worthless food." So the Lord sent poisonous snakes among the people, and they bit the people; many people of Israel died. Then the people came to Moses and said, "We have sinned, for we have spoken against the Lord and against you. Pray to the Lord that he would take away the snakes from us." So Moses prayed for the people. The Lord said to Moses, "Make a poisonous snake and set it on a pole. When anyone who is bitten looks at it, he will live." So Moses made a bronze snake and put it on a pole, so that if a snake had bitten someone, when he looked at the bronze snake he lived. In his conversation with Nicodemus, Jesus says, "Just as Moses lifted up the serpent in the wilderness, so must the Son of Man be lifted up, so that everyone who believes in him may have eternal life." "Eternal Light, Shine in My Heart," no. 340, is the second hymn. It is an ancient text sung to a 1924 tune, JACOB. The words date from the eighth century and are by Alcuin Albinus Flaccus (also known as "Alcuin of York"). He was born in Yorkshire around 735 and was educated under Egbert, Archbishop of York. In 782, Charlemagne asked him to go to France, which he did. He died at Tours in 804. 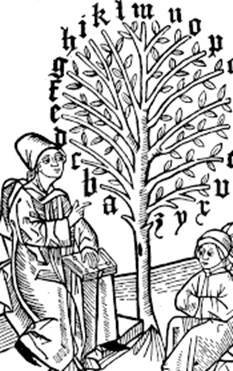 Alcuin of York promoted the use of minuscule letters. It allowed more letters to be squeezed on a page and reduced the amount of expensive vellum that was needed. The words of the hymn were paraphrased in modern English by Christopher Idle, who was born at Bromley, Kent, 11 Sep 1938. He was ordained in 1965 and retired in September 2003. The composer, Jane Manton Marshall, was born in 1924 and graduated from Southern Methodist University, Dallas. She has both a Bachelor's and a Master's degree in music. She is a hymn writer and a composer. Her tune JACOB is used with three texts, "Eternal Light, Shine in My Heart," "How Oft, O Lord, Thy Face Hath Shone," and "We Praise You, Father, for Your Gift." The sermon is titled "A Life of Contrasts." 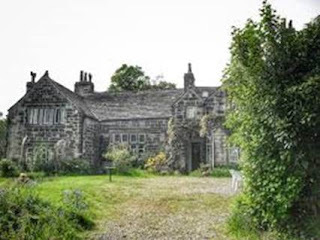 John Fawcett was born on 06 Jan 1739 at Ledget Green, near Bradford, Yorkshire. At a young age, he was influenced by the Rev. George Whitefield and first joined the Methodists. Three years later, he joined the Baptists of Bradford and began preaching at Bradford in 1765. He then became the Baptist pastor at Wainsgate, near Hebden Bridge, Yorkshire. A new building was erected for him at Hebden Bridge in 1777. He lived at Brearley Hall, Mytholmroyd, and opened a school there. 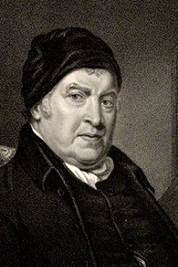 He died at age 78 on 25 Jul 1817. The hymn is sung to the tune SICILIAN MARINERS. SICILIAN MARINERS is traditionally used for the Roman Catholic Marian hymn ""O Sanctissima."" According to tradition, Sicilian seamen ended each day on their ships by singing this hymn in unison. The tune probably traveled from Italy to Germany to England, where The European Magazine and London Review first published it in 1792. The tune was associated with the German Christmas carol "O du Frohliche, O du Selige." The tune also appears to have had an influence on the African American song ""We Shall Overcome."" "O Sanctissima" is sung by Bing Crosby in the movie "The Bells of St. Mary's" 1945.
https://youtu.be/byOhtG4CGXI a part of "O Sacntissima," sung by Bing Crosby in "The Bells of St. Mary's"
The Psalter Hymnal Handbook is right, parts of it do remind one of "We Shall Overcome,"
As mentioned above, the tune in Germany is associated with the Christmas carol "O du Frohliche, O du Selige." William Charles Stickles was born in Cohoes, New York, (north of Troy) on 07 Mar 1882. He was a composer, arranger, teacher, and editor. He attended the Utica Conservatory and Syracuse University, then studied abroad. For five years, he assisted Isadore Braggiotti, a voice teacher, in Florence, Italy. Then he spent two years as a vocal coach for soloists with Felix Motti at the Hof Theater in Munich. After that, he taught in Boston and New York. In April 1912, he was the accompanist for Anna Chase of the Metropolitan Opera in her appearance at the White House for President and Mrs. Taft. On 01 Dec 1919, he married Clara Hazard of Los Angeles in Trinity Chapel, New York City. She was a soprano and soloist at St. John's Protestant Episcopal Church in Los Angeles. He had been touring with her and Theodore Karie (tenor) as their accompanist. He produced many arrangements of standard works for chorus, organ, and piano, and also composed original pieces. He did arrangements of "Smoke Gets In Your Eyes" (music: Jerome Kerns, words: Otto Harbach), "Bali Ha'i" (music: Richard Rogers, words: Oscar Hammerstein II), "Summertime" (SATB) (George Gershwin and Du Bose Heyward), "easy-to-play piano arrangements" of the songs of Cole Porter's "Kiss Me Kate," and also a collection of arrangements of "cowboy songs," along with arrangements of the songs of many other popular musicals ("Oklahoma," "West Side Story," etc.). His Book of Preludes, Offertories, Postludes for all Organs was published in 1957. It was enlarged and published as The Deluxe Book of Preludes, Offertories, Postludes for all Organs ten years later with Chester Nordman as co-editor and composer. He died in Queens, New York, in October 1971. The music for the offertory is "Psalm" by Gordon Young. We more frequently hear another piece by Gordon Young, "Diaspon Dialogue." Gordon E. Young was born on 15 Oct 1919 in McPherson, Kansas. (McPherson is in central Kansas, north of Wichita.) He graduated from Southwestern College in Winfield, Kansas, (south of Wichita), then studied under Alexander McCurdy, organist at the Curtis Institute of Music in Philadelphia in the 1940s. He served as choir director of churches in Philadelphia and Kansas City. Gordon Young composed over 800 different works and received eighteen composition awards. One of his choir anthems is "Now Sing We Joyfully Unto God." 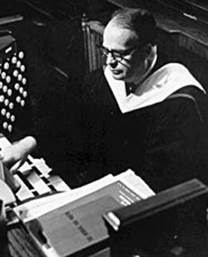 He taught organ at Wayne State University for fifteen years, and served as organist and choir director at First Presbyterian Church, Detroit. Gordon Young died on 02 Oct 1998 in St. Clair Shores, Michigan. The postlude is "Trumpet Voluntary," also by Gordon Young.